Thread your needle with a length of pink tapestry thread approximately 12in (30cm long) and tie a knot in the end of the thread. Turn the cuff of the glove over a little so you can start sewing from the inside, hiding the knot. Bring the needle through to the front of the glove and then put the point back in right next to where it came up. Hold the tapestry wool taut and wrap around the needle four times to make a good-sized knot. Without letting go of the wool, go back down through to the inside of the glove, slipping the needle through the wraps to form a knot. 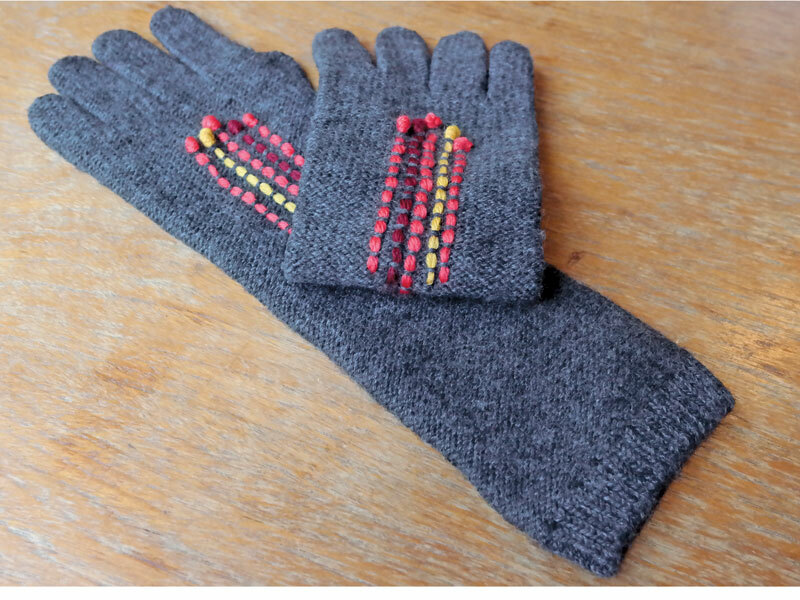 Bring the needle back up onto the surface of the glove a little further down the glove from your French knot. Repeat steps 1–3 on either side of your original line of stitches, staggering the knots and running stitches to create a woven-looking placement. Then with the burgundy thread repeat the process in between an outer line and the central one. Finish with another French knot and line of stitches in yellow on the other side of the central line.